Cafe Pink Pajamas is exactly as fun and quirky as its name suggests. 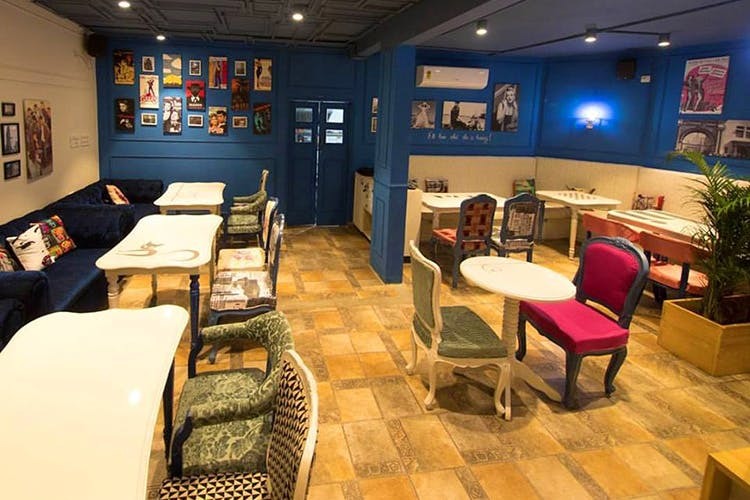 The new cafe in Kalyan Nagar is colourfully done up with mismatched furniture, bright walls and serves all our favourite cafe bites too. Cafe Pink Pajamas caught our eye with its bright pink and orange signage and its whimsical setup, visible through its big glass windows. The place looks like it's straight out of Alice in Wonderland. We’re talking bright blue walls with pop culture posters on them, mismatched furniture with different kinds of tables and chairs in every spot, with each chair upholstered in a different funky pattern and colour, plush blue couches and a proper cafe counter complete with a display case full of quick bites. Yep! This place has all the works. And if you’re a pop culture nerd like I am, you can make a day of identifying every single pop culture reference in the cafe. Possibly your next favourite hang out spot, Cafe Pink Pajamas is definitely worth a visit just too escape the mundane surroundings for a bit, and check into wonderland. The menu include pastas, thin crust pizzaz, burgers, and sandwiches to name a few. Wash it all down with their mocktails or smoothies, or stick to your teas and coffees. Everything is reasonably priced and a meal for two will leave you about INR 600 short. Cafe Pink Pajamas also does All Day Breakfasts, starting at INR 210, so walk in anytime and load up on your favourite meal of the day, with a good dose of whimsy to go along with it. Sadly, the menu doesn't match the whimsical theme, as they in fact, serve regular cafe fair.